Last weekend was the end of the most recent bout of cold weather and, yes, even snow. The mountains were beautiful in their fresh white coat, but the wind was bone chilling. Stray snow showers were lingering over the highest peaks even late yesterday based on what I could see to the west. Things seem to have mostly cleared out though. Here are a few pictures from Saturday afternoon. Even more importantly, even if you don't know anything about this, PLEASE pass along the information. Drift boats don't just fall out of the sky so I'm guessing someone has or will see this boat. Thanks! There is currently a huge sale going on at the Orvis Sale Outlet. I just found some killer deals on tungsten beads and some extra wading boots for a friend. Currently, everything that is already on sale is eligible for an extra 25% off but that special deal is only good through THIS Sunday. In other words, you only have today to take advantage of anything you need to get. While there aren't tons of great things available, there are some killer deals on wading boots and a few other items. If you need to pick some boots up cheap for your kid or anything else, now is the time to do it!!! My trip last weekend was the fishing version of making hay while the sun shines or something like that. I had tentatively planned, or perhaps considered is a better word, a couple of camping trips this fall. Every time something came up though so when last weekend was looking like good weather, I figured it was high time I headed for the hills before the snow started to fly in earnest. The long range forecast was already hinting at our current cold and snowy weather so I had extra motivation to get out and fish before things became too miserable. The thought of sleeping in my own comfortable bed kept me home for one night to rest up for the next two days of bliss in nature. When I finally headed out, it was after a leisurely breakfast and all around relaxing morning. As a fisherman, I know how to get up early to get to the good water ahead of everyone else, but for this particular trip, I was not too worried about fighting any crowds. Some waters are thankfully overlooked. On the way, I was continuously in awe at the beauty of the mountains surrounding me. When I finally arrived at my destination, I took the time to figure out where I would be pitching my tent for the night and then headed out with the fly rod to look for some fish. The perfect fall weather allowed me to simply wear Chacos instead of messing with waders and boots. I soon found myself patrolling a likely meadow stretch and probing the undercuts and log jams with a nice yellow streamer. 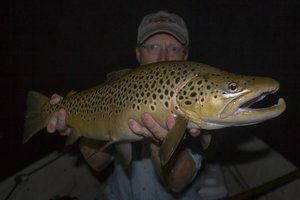 Less than stellar results soon led to a fly change and then I started locating fish consistently. The fish would flash out from a deep cutbank or weedbed in a pool or a mass of logs that just screamed "brown trout castle!" For some reason, I was still having a difficult time connecting though. One particularly nice 18-19 incher surged out of a huge weedbed and when I threw back after missing him the first time, nailed the streamer but unexplainably still missed the hook. Dejected, I continued exploring until I happened to look over my shoulder. This would be the theme of the week. Great scenery surrounded me but it seems I only noticed when I slowed down enough to glance around and actually enjoy it. 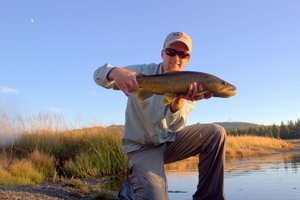 Realizing its never just about the fishing, I decided to try a new stretch of stream and began fresh with a new mindset. Moving with stealth, I was soon spotting fish. However, I didn't catch many and definitely nothing too large. It was one of those days where I was just enjoying the experience and never bothered to pull out the camera until the last fish of the day. 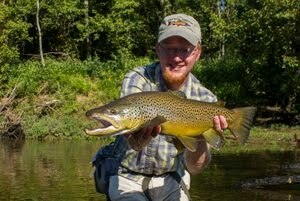 It was a chunky brown and I was content to call it a day after landing the colored up beauty. Glancing over my shoulder, I was again reminded that I needed to slow down. Time away from nature tends to speed life up and complicate things. Staring at the sunset transforming the sky above, I was mesmerized into remembering why I actually bother to head out into the wilds. The rest of weekend proceeded at a much slower pace as I began to actually enjoy the experience instead of just making the experience. Things were now right, and I knew that the next day I would fish much more efficiently. Mindset is important even in fishing. My best days fishing have always come once I was relaxed and not trying too hard...I had reached that point and knew that the fish better watch out the next day. After taking in the sunset and remembering that I did have a camera with me, I headed back to camp to fix some food and maybe even see some shooting stars. Having accidentally left my fleece, I layered on the long sleeved shirts and topped it off with my raincoat as a windbreaker. Camp chair set up in the now dark camping facing the mountains, I sank down to enjoy the stillness of the night. Overhead, the stars were shining brightly and it was only a couple of minutes before the show started. The Orionid meteor shower was supposed to be happening, and seeing one so quickly suggested it might be a good night to try and photograph some. Digging out the camera along with gloves as the cold was starting to take a toll, I started taking pictures. Sadly, other than two more shooting stars, the show was pretty much a bust. The night sky was awesome though including the moon. I enjoyed shooting until the cold was too piercing, and I headed for the warmth of my sleeping bag for the night. The long night was made longer by the fact that the "forecast" low was reached probably by 9:30 p.m. and quickly passed as the mercury dipped lower. My sleeping bag was still within its acceptable rating temperature wise but I definitely could have slept warmer. Thus, when it became light the next morning I was excited for the sun to hit my tent and warm things up. After going for an extended period without the light getting significantly brighter, I made myself squirm out of the sleeping bag and back into my long sleeve shirt layers. A thick band of clouds was blocking the sun to the east although it had risen above the ridge at this point. Deciding to try and get some good shots in, I drove down the valley searching for the perfect light and angle to photograph the mountains to my west. Experimenting several times, I found several nice shots although not the one I had originally envisioned and hoped for. What a perfect excuse to go back sometime!!! Just about the time the sun burst from behind the clouds, I realized that since the stream was so close, I should probably fish a little before heading back to camp for breakfast. 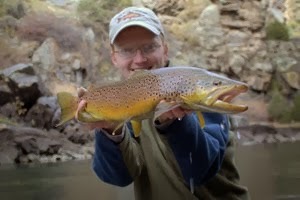 I was soon into fish including a nice 15 incher that shot out from a dark undercut bank next to a back eddy. Happy with the experience, I didn't even bother to take out the camera. Not far upstream, I would decide the camera was a good idea. I was walking slowly just looking when I spotted two browns laying out on the far side of a deep hole watching for a meal. When I spotted the fish I was already too close but decided there was nothing to do but attempt a cast. With the sun almost directly behind me, they may have been blinded and not able to see me. Whatever the reason, when my fly splashed just upstream, the larger of the two nosed over and decided to see if it was good to eat. After a brief fight on 2x tippet, I horsed the beautiful fish into the shallows for a couple quick photographs. Releasing the fish, I made sure it was ready to go but kept the camera ready. As it swam purposefully away, I shot three quick photos and the first one turned out great. Looking up, the reflection of the forest called for a photo as well so I just kept on shooting. After working upstream a bit further, my stomach reminded me that I still had not eaten breakfast (unless you call chocolate chip cookies breakfast), so I found myself headed back to the car and then camp to take down the tent and also eat something. Along the way, I found more photo worthy scenery but was hungry enough that I was satisfied with just a shot or two. Fueled up with some awesome pomegranate and dried cherry granola, it was back to the hunt for fish. Lots of fish were out feeding by this time of the afternoon. 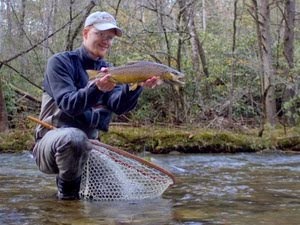 One nice trout in particular was in an almost impossible spot with heavy brush both above and around. I finally managed to drop a fly in but only after spooking the fish so my efforts were futile. Not far upstream, a different story emerged. I found a nice female brown hanging out watching for food. She followed my fly on the first cast but missed the hook. The second cast was right on target and I watched as she turned and ate. Carefully taking a picture, I had her back in the water in no time and she rocketed back to the sanctuary of deep water. The rest of the afternoon became more and more focused on pictures. Eventually, I realized that more fishing would probably be greedy and it was time to head towards home. Starting the week exhausted was not in my plans and I didn't want to get home too late. My sudden urge to travel coincided with the elk's late day trip back to the meadows to feed. The zoom lens I had been lugging around all weekend suddenly seemed awfully necessary as I quickly changed it out with the lens I normally leave on the camera. During my drive out of the area, I came across at least 5 separate herds of elk. The males were still bugling at least occasionally which is always great entertainment for a Tennessee boy who only saw such things on National Geographic growing up. After tearing myself away from the last photo opportunities, I headed home content. The mountains fill my soul with such tranquility that it is always a little sad to leave, but I realize that the greatest impact I can have on society is probably where people actually live so it was not entirely reluctantly that I travelled back over the mountains. I was rested and rejuvenated to teach for another week. I'm in the recovery phase right now. My weekend was spent camping near a winding meadow stream. The browns were hungry, the sunsets were spectacular, and yes, the elk are still around and even bugling occasionally. More to come once I make it through a day of work and get a little rest!! !